Rista is a popular Kashmiri Cuisine which takes a lot of efforts to prepare but it’s all worth it. You may have had meat balls or kebabs, Rista is just like that, but softer and tastier. To prepare these you require Minced meat (Keema), but to Prepare Rista, you would require to make them even finer minced meat. To prepare these you require Minced meat (Keema), but to Prepare Rista, you would require to make them even finer minced meat. For this you require a special Wooden hammer and wooden log to process the meat into Mince the meat. What the Wooden hammer does is, it makes the meat very fine. 1. Take the boneless mutton and mince the mutton using the Wooden hammer as shown below in picture. It is going to take some time so do it until the meat looks like Halwa. While you are doing all this, try taking out all the fat lines you get in the mutton. We only need flesh for this. 2. Now grind ginger, garlic and green chilly without adding the water. 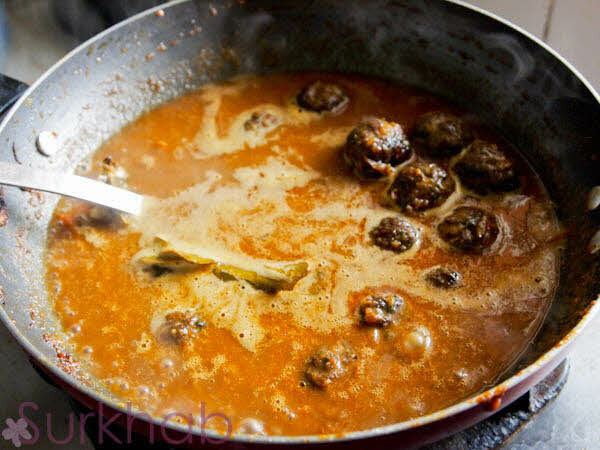 Take minced mutton in a bowl or plate, add grind chilly, coriander leaves, salt and fried onion. 3. Mix it well to make the round balls approximately 3 inches in diameter. 4. Put the round balls in kadhai /pan and cook covered on slow heat till 10 minutes. 5. Now heat the oil in non stick pan and deep fry the cooked balls and keep it aside. 6. For the gravy, Heat the pan with oil, add onion and cook on medium heat till onions are light golden brown. Now grind ginger, garlic, cumin seeds, cardamom brown and green, pepper and nutmeg. Add this grind spices in fried onion, add red chilli powder, turmeric powder, coriander powder, bay leaf, tomato and salt. Cook till oil shows separately. Now add fried round balls in the garvy and 1 cup water. Cook covered on medium heat till 5 minutes. Rista is ready and serve hot with Chapatti or rice.